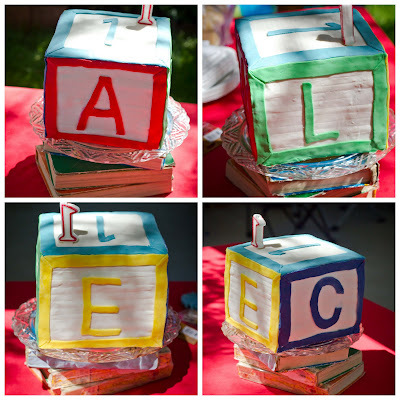 So what if he was going on 15 months, Alec finally had his first birthday party, full of A’s B’s and C’s (and other alphabet letters, too)! 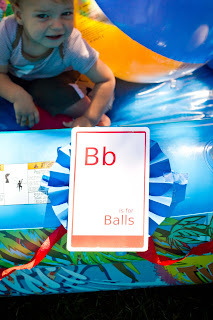 Alec loved playing with the balls in the pit! As in, we had a ball and a ball pit! We filled an inflatable pool with as many balls as we could find for a make-shift ball pit. I didn’t anticipate that the big kids would enjoy it so much, too! 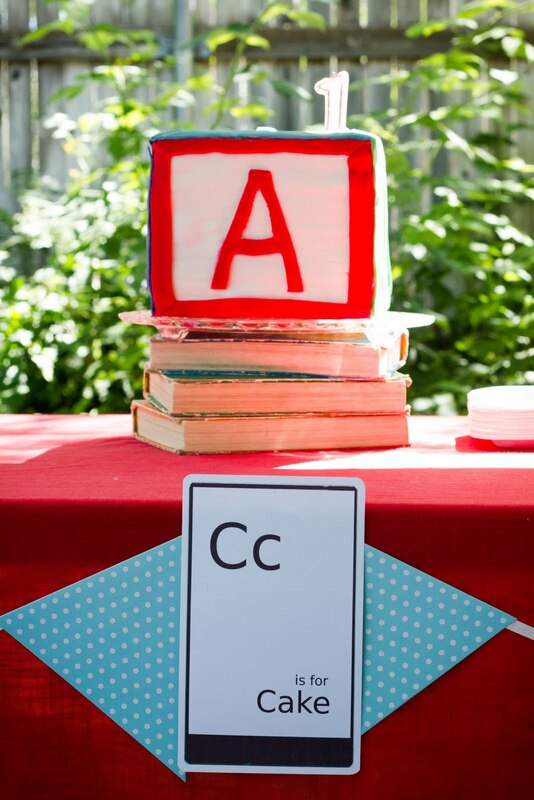 Stacked on a pile of vintage books, I used each letter of his name as a side of the alphabet block, with the #1 on top. 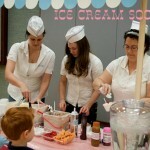 Special thanks to Ashlee @ I’m Topsy Turvy, for giving me some baking/decorating advice! She is master (mistress?) of fondant! 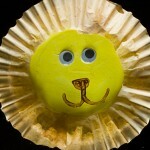 That smooth fondant exterior didn’t fool him one bit! He knew there was good stuff inside, and started digging right in. He wasn’t so sure what to do with the candle flame, however. But there were more cake surprises inside! I customized plain plates and napkins to fit the theme (I might have to experiment with these a little more before I post a tutorial or recommend you try this at home. Love the idea, still perfecting the technique!) 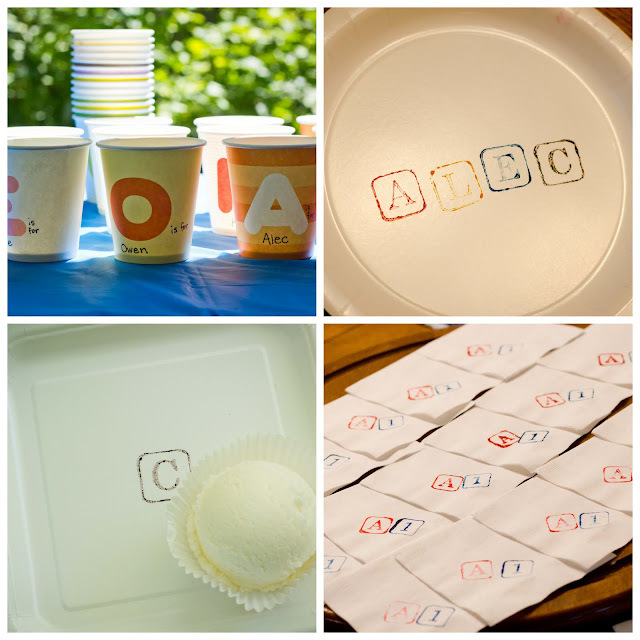 I had won the fun cups on a giveaway a while back and used a fine point sharpie to personalize them for the guests. 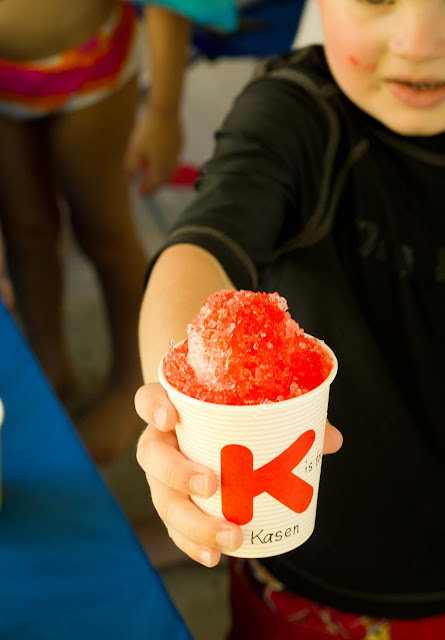 They made great snowcone cups. On the menu: Hamburger sliders on homemade buns (thanks mom!). 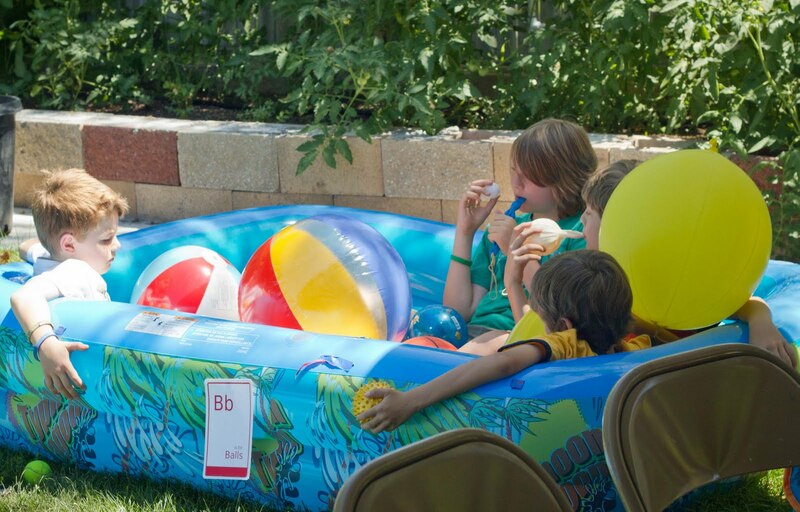 Perfect size for the little ones, and easy to grab a few for the big guys! French fries and carrots set out in serving-sized cups. 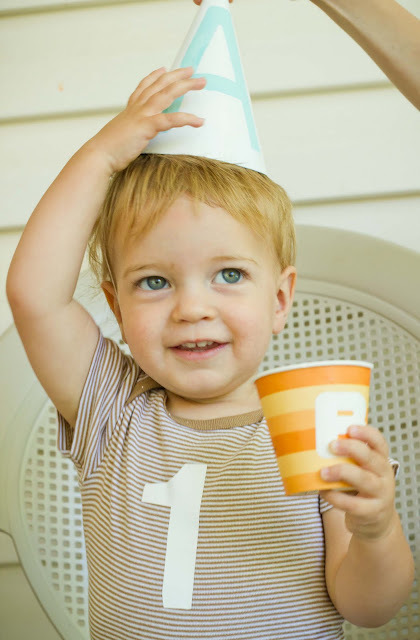 There is ketchup in the bottom of each cup, eliminating a lot of mess and hassle with serving small children. We also had alphabet finger jello, colorful melon balls, and juice boxes. 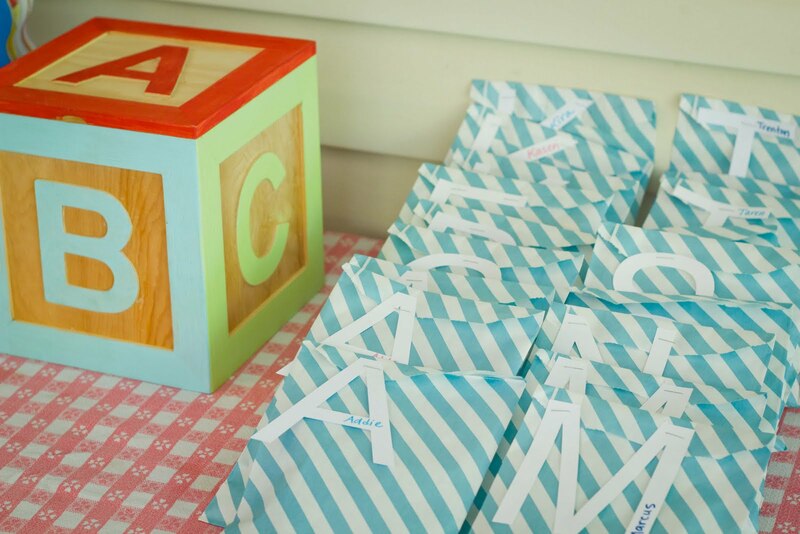 Alec’s cousins each took home a simple goodie bag filled with some ABCs and ball fun. 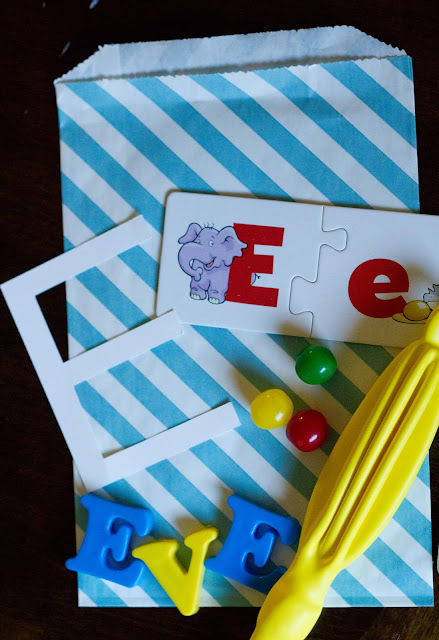 Where possible, I tried to give each child the letters of their names with the alphabet magnets. They were packaged up with their own monogram as a label. 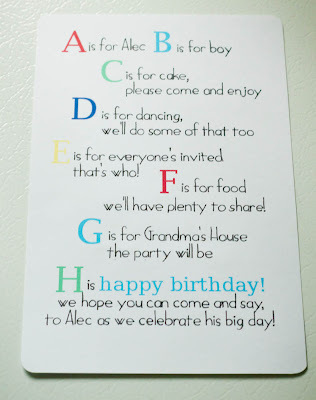 Those are the ABC’s of the party! I plan to write posts about some of the how-to’s later. Is there anything you’d specifically like more information about? 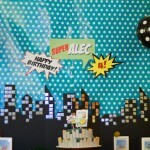 You can see some of the inspiration for this party on my Pinterest Board, here. I’m also working on a personalized ABC photobook for him, I will share later. Big thanks to my mom for all of her work on the food and letting me throw a little insanity in her backyard! 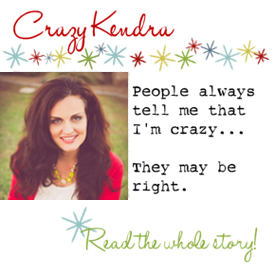 Kendra, you really are insane! Insanely COOL! This party is So SO great! So cute, I love your party style!! 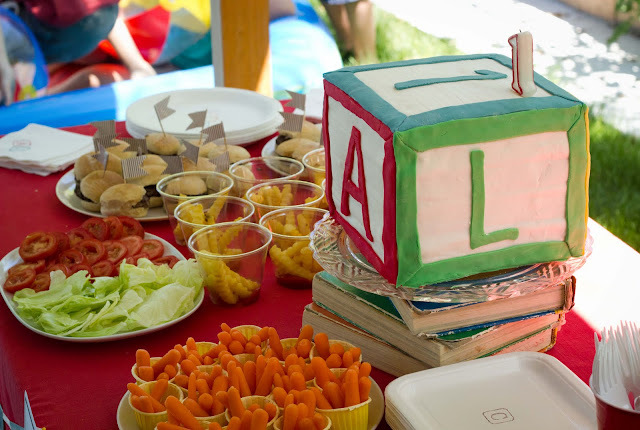 That is a perfect birthday cake for a child. Just change the number on the top. This was an amazing party! So cute and the kids look like they had a blast! 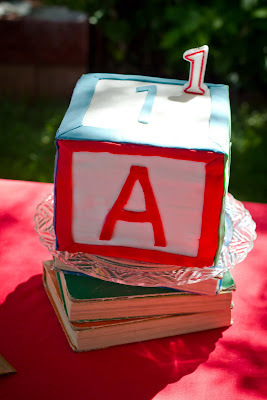 the cake looks great! Were you happy with it? 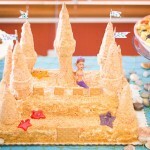 I admit I'm never fully happy with most of my cakes, but no one else seems to notice what I do. The colors are fantastic! Love the 4 layers inside. I stamp all my party plates as well! I use food safe markers on my stamps for my plates, but I've also used a blank stamp pad and food gel, but then I'm stuck with just one color. 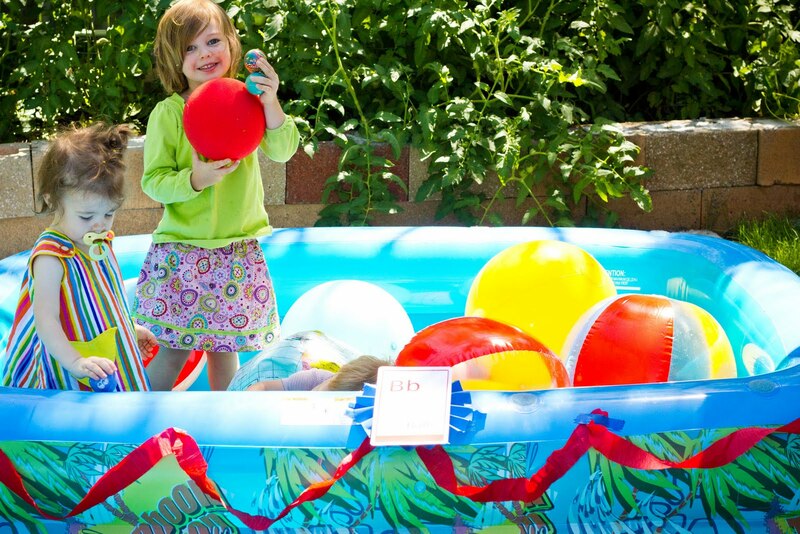 The whole party looks like so much fun and everyone had a great time! 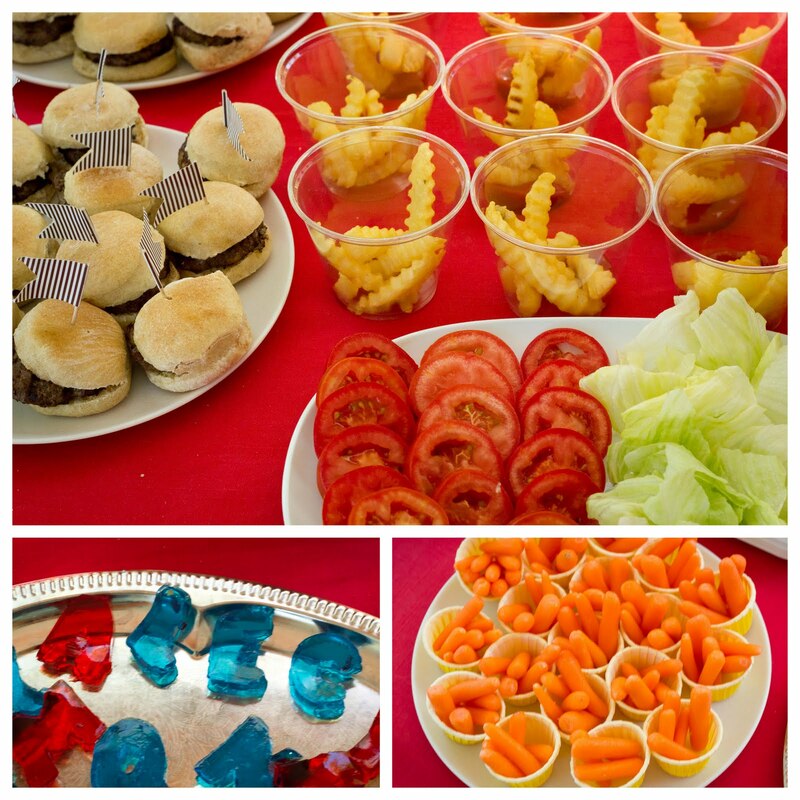 Congrats on another wonderful party! I love this party. 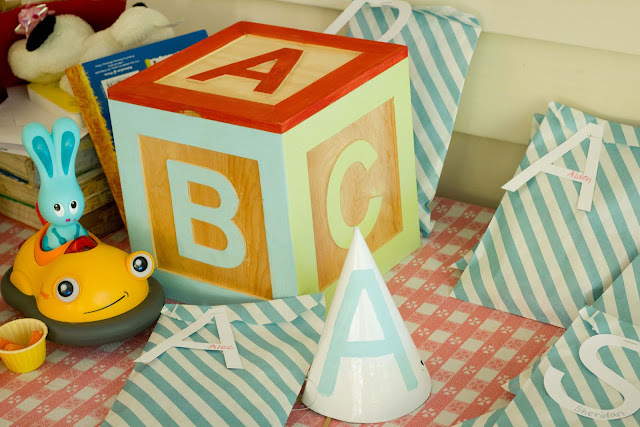 I love all things ABCs and you have so many adorable details here. Your little guy is so cute (I was going to say he looked a little older than 1) but I totally agree it doesn't really matter exactly when it is. They surely don't know yet. I would love it if you would stop by and share at the link party going on right now at Lines Across My Face. This looks like a fantastic party! So many fun things! A is for Adorable! (sorry I couldn't help it.) I am loving all the details. 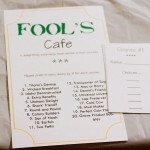 The invite is perfect, the cake colors are amazing, the flash cards are so fun and I loved the personalized paper goods! 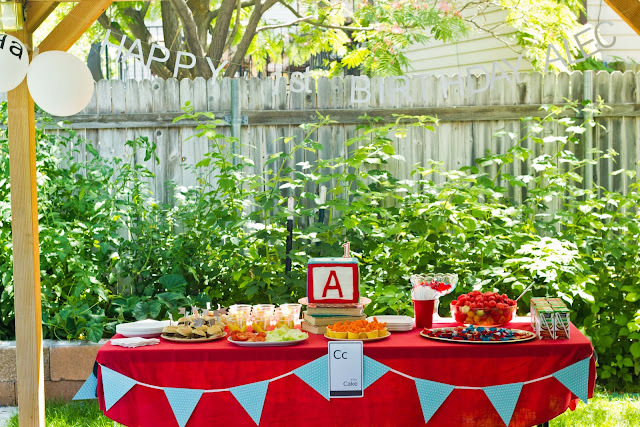 I would love it if you would share your party at my August "It's a Celebration" link party. 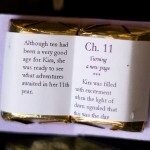 I know my readers would love this as much as I do! Very cute party! 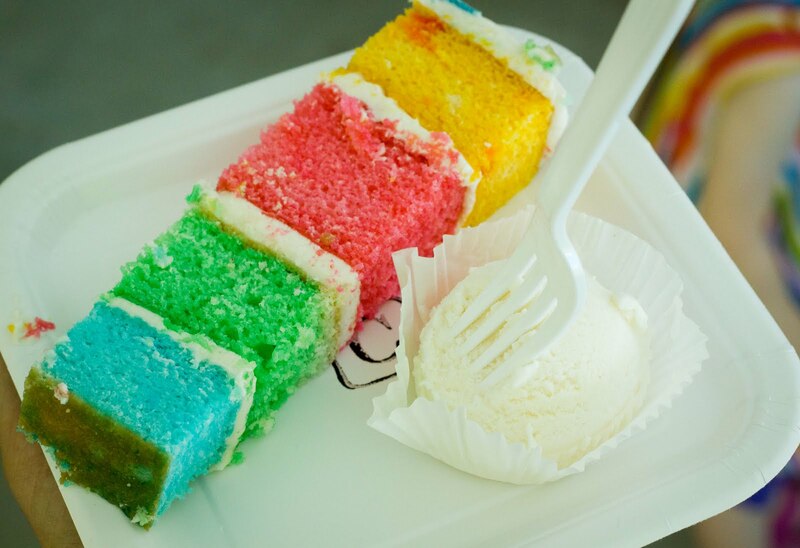 I love the cake. What a great Birthday! I am in love with the inside of that cake! The portion cup carrots and fries is a Great idea! I know the kids had a blast! Wow! 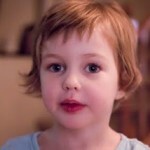 This almost makes me want another child! Love it, just added it to my pins. Just wanted to let you know I'd be featuring this on Topsy Turvy Tuesday's this week! Thanks for linking up! I'm so glad it turned out so great, it's just lovely! Ok this party is amazing! 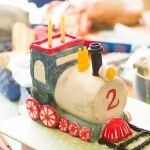 And the cake is sooooo cute! 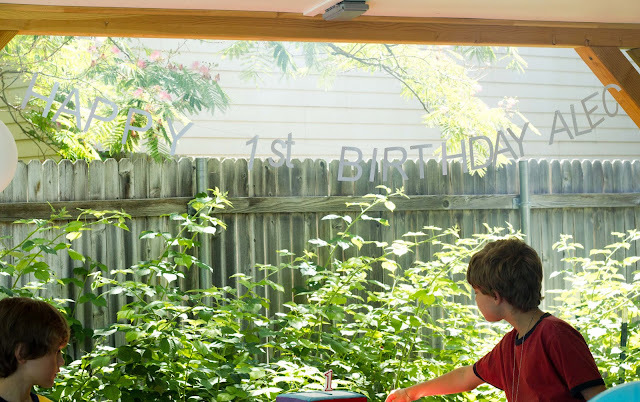 I have people guest post every Friday featuring their parties on my blog and I would love it if you guest posted! Email me if you are interested! I loved the theme and the way you worked it out. Wish I had seen this before. 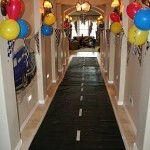 My nephew's b'day is coming up and I would have suggested this theme had I visited your blog earlier!! Pinning the idea. Thanks for sharing. What an AWESOME Party!! You are soo talented I LOVE it! I love to throw parties.. 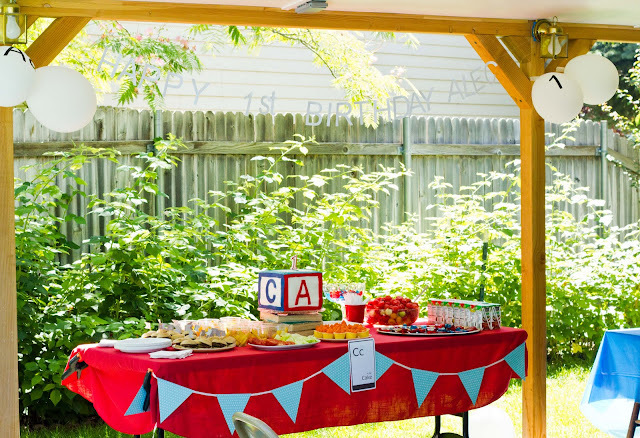 I'd love for you to come by my blog and check out some of my party ideas!! THanks for posting and sharing I saw your post over at Topsy Turvy Tuesdays I'm sooo glad I found you!!! Fun! 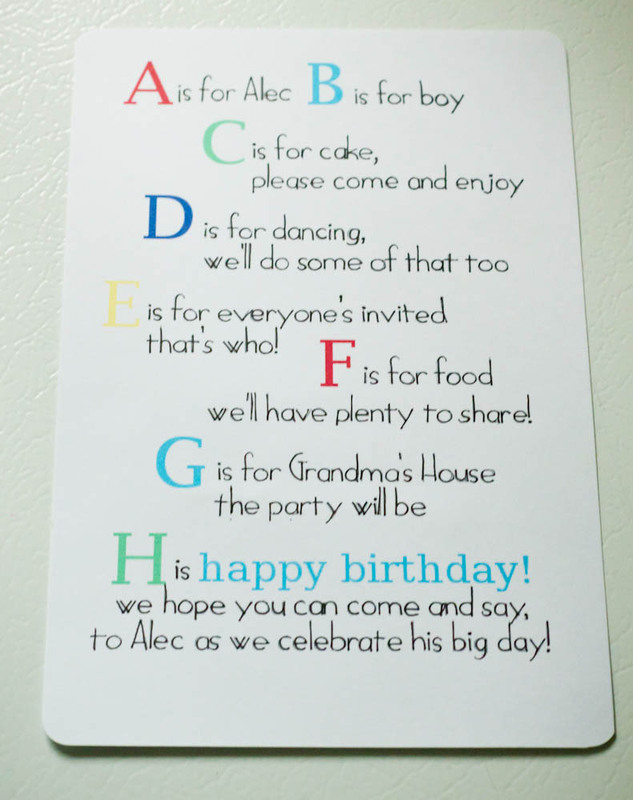 I found your site looking for inspiration for our own ABC party. 🙂 Your cake is amazing. 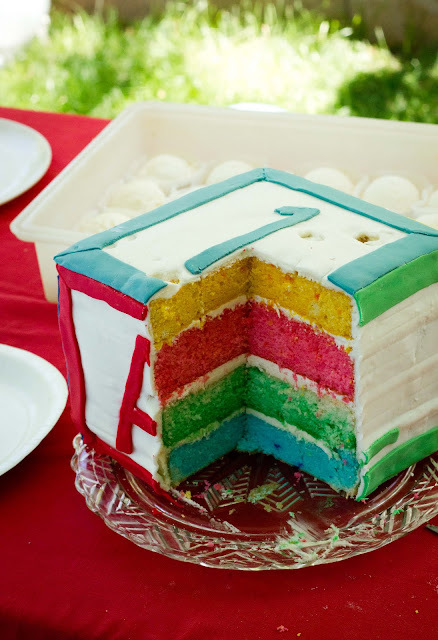 I REALLY want to do the ABC Rainbow Block cake for this weekend. I can’t seem to find the instructions to make the cake. Can you give me advice on getting the layers the right colors, decorating the cake or anything that would help me pull it off. I’d really appreciate it. I am going to just wing it if I can’t find anything to help me out but if you have recipe or anything I’d love it. 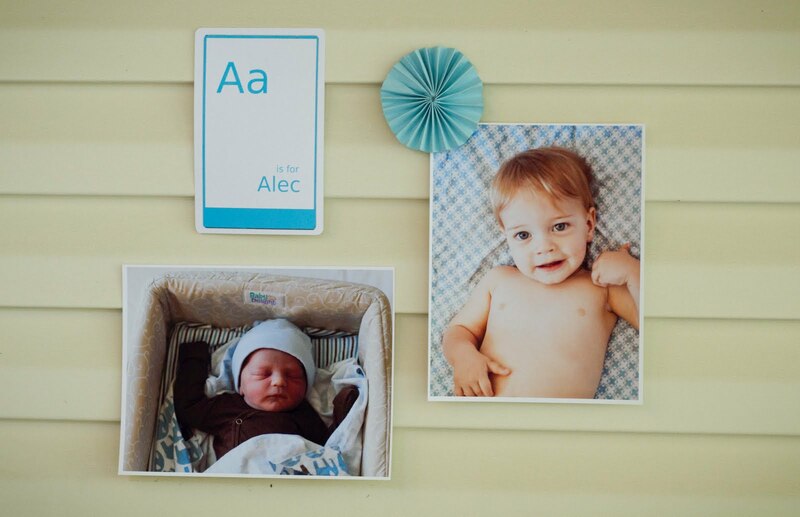 What a cute array of goodies for Alec and his guests! Love the cake especially. 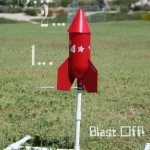 Themed birthday parties are certainly so much fun and a sure fire hit for kids! Thanks, Chey! I can’t remember for sure whether it is an 8 or 9″ cake, but I’m guessing 8 so it would be easier to make it as tall as it is wide. Just a standard square cake pan. wow cool. Can I have plz the cake recipe? 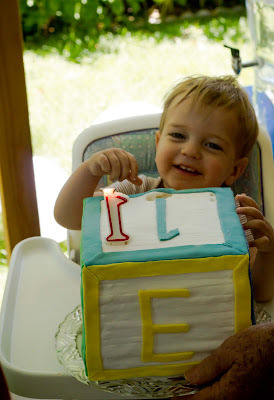 my daughter first birthday is in 1 week and I’m looking for a fun cake to make. I adore the one you made! Can you please send me the recipe? I generally use this recipe when making a cake that I want to hold it’s shape: http://allrecipes.com/Recipe/white-almond-wedding-cake/detail.aspx . For the ABC cake I divided the batter evenly and added the food coloring before baking. (I think I probably made a double recipe). I used an 8 (?) inch square pan, and 4 layers were enough to make it a cube. I hope that helps. Hei KAndra I love your tema and I’m gona make the same to my daughter shes making 6 in April. thanks for the pictures and ideias. I ‘m gona make the same food( hihihih). I found the cube box unfinished at the craft store (I don’t remember which one at this point). Then I just painted it. I bet you can find something similar in stores or online.